In what I can only assume is similar behavior to NPA outdoor in New York, Poster Giant is wreaking Havoc on Seattle's public space and in the process destroying local culture, promoting conspicuous consumption and creating a few enemies. Sign the petition at Change.org to help the community express its outrage [Here] As reported in the local Straphanger, it seems the community is pretty upset. It will be interesting to see if the community can bar Poster Giant from operating as this is the type of control the public should have over how public space is used. I wish them all the luck in their campaign. Poster Giant power washing their posters off of a mural they covered up after outrage amongst the community forced a quick response. Poster Giant has a long and bad history in Seattle. They routinely destroy the work of D.I.Y. artists, organizations and businesses to further their own agenda of monopolizing public space in Seattle by preventing any posted advertisement (except their own) from being viewed. In the past (and recently), they have threatened community members with violence for even requesting politely that they not destroy their work. 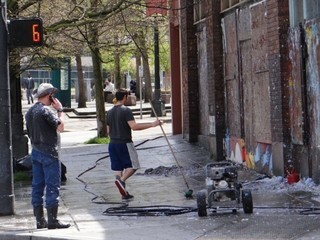 Most recently, Poster Giant destroyed an amazing work of art in Pioneer Square. As expected, they took action only after receiving significant bad publicity, after the destruction was reported in the Seattle P.I., but anyone that knows this company, surely knows that they have used threats of violence and destructive retribution to further their cause of monopolizing our public space. This cannot be tolerated: Poster Giant must stay within the bounds of the law, and must renounce the violence and destructive retribution that they have utilized as their business model. If Poster Giant refuses to comply, then we must take firm action and rebuke their tactics through a meaningful grassroots campaign to bring awareness of their tactics to those whom count most: Their own clients. Join me in forcing Poster Giant to play by the rules. "Doug Cox started Poster Giant in 2000 — long before Seattle lifted its ban on street-level postering."